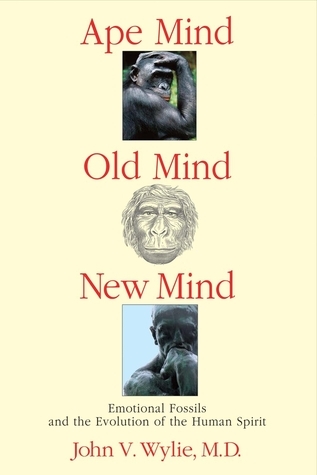 Review: ‘Ape Mind, Old Mind, New Mind’, by John V. Wylie, M.D. Ape Mind, Old Mind, New Mind is a personal memoir by a psychiatrist who gradually discovers from his patient’s descriptions of their mental illnesses that human motivations have been evolved over millions of years for productive engagement rather than competitive fitness. A new uplifting and spiritual view of human nature emerges that is not only consistent with the science of human evolution, but also opens up a simple explanation for such ancient mysteries as self-awareness, reflective thought, and the vast complexity of language. All other books about the evolution of emotion approach it from the “outside” as an object; this book is about the biological evolution of the “inside” experience of emotion-and-motivation, which can only be known empathetically. I meant to review this book last week but life got in the way. The author contacted me last year to ask if I’d review his book; since it sounded interesting I agreed and he sent me a copy. With a very nice little note too. Evolutionary psychology tends to have a bit of a questionable reputation, due to its use by misogynists and other bigots to support their bigotry. It’s one of the many things they don’t understand. The author finds a good balance between academic and lay-person levels of understanding. His experience of clinical practice as a psychiatrist clearly informs his interpretation of current evolutionary theory. Wylie draws heavily on the work of E.O. Wilson and is inspired by Darwin in writing his own work on the subject. I’m not sure how much I agree with his interpretation; there’s a very Judeo-Christian inflection in his ideas, to be expected from a man of his family history. For example, I struggled with his hypothesis that hominin females were selected for obedience while hominin males were selected for justice; sounds very ‘complementarian’ to me, and clearly there are historical examples of this not being the case. In it’s reference to the Spiritual, the book is clearly written to appeal to the US public, where an overtly atheist text would probably be ignored or condemned. I am ambivalent about this book. It was interesting to read, but some of the author’s conclusions are unsettling.